If you are interested in driving traffic to your website or are into list building or affiliate marketing, then you probably know the importance of a great headline. It’s often been said that the ability to write great headlines is the most important skill in all of copywriting. That might be true. After all, unless you have a great headline your selling message won’t get read. This applies to solo ads, classified ads, sales letters, blog posts, social media marketing … basically, anytime you communicate with the public. In the email marketing and solo advertising business, we often talk about the “hierarchy” of a great email ad. That’s just a fancy way to say that any email ad, especially a solo ad, must have three key elements in order to be effective. And by effective, I mean profitable. If your ad has those three things you will likely do very well indeed. If you get one of them wrong you risk losing profits. How do you write a highly effective headline or email subject line? Most professional copywriters have a swipe file they use. When they see a great headline or subject line they copy it and use it for inspiration. Of course, we never want to use anyone’s copy word-for-word without express permission but we are free to draw inspiration from great marketing. And we should do so. A second trick of the trade is having a blueprint to follow. By blueprint I mean a simple “fill in the blanks” formula that empowers you to crank out winning headlines and subject lines all day long. So if you’ve ever wanted to write great headlines and subject lines at will, or if you’ve ever been stuck and not known how to get started, the blueprints below will help. NOTE: In the examples and information below I’m going to refer to these blueprints in email marketing terms. The truth is a great headline IS a great email subject line and IS a great article title and IS a great blog post title and IS a great Tweet and so on. It all has the same purpose, to get people to read more and take action. Heck, you might even find a new career as a headline writer! This is a great results-driven subject line that is certain to get people to open up your email and take a closer look. The idea here is to use the classic combination of something the reader wants with a way to get it. By including “this works like crazy” you are saying “here’s how to get what you want”. All you need to do now is fill in the blanks and include what they want. Your job is to provide the “what they want” part in the provided blank. Obviously, you want what you are offering to be something that is highly sought after or highly interesting to the reader and is directly related to what you are going to share in the email itself. This subject line is great for just about any kind of mailing, whether it is a content mailing or a promotional mailing. People open it for one reason and one reason only: it promises to reveal something that produces a result they want to achieve. One of the basic human motivations for response is driven by a fear of failure. This subject line is the exact opposite of the first one we looked at which hinted at producing results – this one hints at NOT producing results. The idea is to talk about what they want and then an appropriate negative statement at the end after the word “won’t”. Who could resist opening up to see WHY? Not many of us, I can tell you that. HINT: Substituting the word “can’t” for “won’t” works very well. Feel free to experiment with other synonyms too. If your result is something that we WANT to achieve, then certainly we’d want to read your email to find out what might prevent us from achieving the result. It’s a great time to reveal a mistake or a problem or a hindrance … and then offer your product or service as a solution, which will produce profit for you. Once again we are tapping into the fear of failure, a powerful motivator. This subject line that focuses on the negative or adverse result – things your subscriber wants to avoid if he or she is going to achieve the results they want. The difference with this subject line and others that offer a sort of warning or caution is the emphasis here is on the word “biggest”. This isn’t just a mistake, it’s the BIGGEST mistake. It’s the number one, most common error that folks make regarding a particular topic and curiosity alone will get people to open up JUST TO SEE WHAT IT IS. Yes, they’ll certainly be concerned about whether or not they are making this particular mistake, but more than that, they’ll want to know WHAT this particular mistake is. What IS the “biggest” mistake? HINT: Adding the words “and how to avoid it” or “how you can avoid it” works very well with these headlines. Obviously, the biggest mistake would be a matter of your opinion, so it’s open to your own objective perspective, which makes this one an easy subject line to work into your mix. And, it definitely is effective. Now it’s time to talk about the other super-motivator, the promise of gain. Here we focus on being “fast”. We all want results – and, let’s face it – we all want them as quickly as possible. We live in a fast food world that promises instant results and that’s what we want. So, the key here is that word “fastest”. This isn’t just a way to success with a particular topic; it’s the FASTEST way to success with a particular topic. Additionally, I’ve found that if you can plug in SPECIFIC results it makes this one so much more effective. Notice in my examples that I didn’t make outlandish claims, I made reasonable claims. It wasn’t the “fastest way to make a million dollars online,” but rather “the fastest way to make $500 online”. Not “100 pounds”, but “5 pounds”. Not “play guitar”, but “play guitar chords”. (2) Readers will subconsciously think they can INCREASE the results by DUPLICATING what you share inside. It’s human nature to think you can do better than the next person. That may or may not be the case, but that’s what many people think, and it compels them to take a look because your claim is BELIEVABLE and ACHIEVABLE. This is a great information gathering subject line to use when you want to survey any mailing list, be it your own or if you buy solo ad space. Surveying and taking polls works, and works well, and this approach helps it work even better. The more you know about people who might become customers – what they WANT to know from you, what they are most likely to buy – the easier it is to provide them with quality content they can use. So, this is a great subject line to gather information with, by allowing your subscribers to submit their most wanted question to you. HINT: You can change this headline to read “answers to your _____ questions” and it will work just as well. LIST BUILDING TIP: You can promise to answer the top 5 for free in a report or training call or give a free copy of your completed product to all those who submit a question (and join YOUR list) or whatever you choose as far as the offer inside. Once again we have the “curiosity” factor in play. What is it that I need to know? The word “need” is very powerful and compelling. It gives the impression that something is a necessity, that it is required. Testing has shown that putting a special emphasis on “first-timers”, “beginners” or “newbies” will increase the results of this headline or subject line. Because they are inexperienced, they are more likely to not only recognize they do have needs because of their lack of knowledge but also will be eager to learn those things that you feel are necessary or required for success. Why do you think the Dummies® books have sold so successfully? Newcomers to the subject want to know what they need to know. And that’s why they’ll open this email up and take a look inside. When I say “shortcut” what comes to your mind? Think about it for just a second. You likely envision something that is “faster”, something that is “easier”, something that gives an “advantage”, something that “reduces expenses or effort” – all of which are highly desirable. We all want to take the shortcuts in life – the easiest, fastest and most advantageous path to our destination. Which explains why this subject line continues to be among the most opened in my email marketing. It doesn’t matter if it’s rose gardening or entertaining in-laws or boosting metabolism or racing radio-controlled cars, we all want a shortcut. When you can tie in some kind of product, software or service that fully or semi-automates the shortcut, then you’ve got a very good chance of getting the sale. Just a quick, very generic example: You might share that a shortcut to success with customer support is to have a text file with your most asked questions and responses to those questions. so when a new customer asks a question all you have to do is copy and paste your response instead of retyping out a response. When a new customer asks a question all you have to do is copy and paste your response instead of retyping out a response. Now, you could also PROMOTE an autoresponder service that would actually automate the process of getting those answers to the customer. You could also promote a package of template responses to the most asked questions or promote a customer-service help desk software or even a third-party company that provides customer service. The point is this: If you can provide readers with a quality shortcut, but then also promote a product, software program or service that automates that shortcut, you’re much more likely to get a sale. One of the things that most human beings want – at least the human beings that I know – is a set of instructions that we can follow to make sure we do things correctly. That’s why offering a free checklist as your subject line is yet another great way to increase your open rate and get subscribers delving deeper into the mailings you send out. I personally have seen greater results by giving the checklist a title. Not just “Here is your interview checklist” but “Here is your ‘Acing Any Interview’ checklist”. Not just “Here’s your wedding checklist” but “Here is your ‘The Perfect Wedding’ checklist”. A good name adds more desirability to the checklist. Obviously, in your email, you’ll want to provide the checklist. And your checklist is a PERFECT spot to make recommendations. Refer readers to your product or affiliate products for more information on every entry in the checklist. A classic example is the “Setting Up An Internet Business” checklist where some of the steps would include “buying a domain name”, “finding a web host”, “creating a blog” etc. For most of those steps, you could provide a brief overview of them and then point them to resources to do the very things you instruct them to do … most of which make you money. This is the one email subject line and corresponding email message that EVERY LIST OWNER should have in their sequences somewhere. This is a great subject line to use in promoting an affiliate link, especially if there is some kind of free information or discount involved at the affiliate site. SUPER IMPORTANT: If the product or program you are promoting in your affiliate marketing offers free information you will do better by promoting the free information than by promoting the product or program directly. There is an element of newness and freshness here with the “I just found” reference at the end of the subject line, which brings a sense of urgency – we desire to be the first to know, the first to use. Again, just another solid way to get folks to open your emails. This subject line is one of the strongest in the group. It works again with the fear of loss super-motivator. It goes beyond sharing a mistake or even the biggest mistake to the point of revealing something that can have a devastating effect on the reader if they fall victim to it. Again, we’re talking about both awareness of a potentially destructive pitfall, with a provided solution, only this time, the language is stronger in that it could “ruin” the results for the person on the other end of the line. HINT: Don’t overuse this one and don’t use it for things that readers might consider “minor”. There are products we promote that can have a dramatic impact on a person’s life – this type of headline or subject line is best used for those types of products in my view. In this email, you’d want to reveal the most disastrous, destructive stumbling block that the subscriber might face, along with a solution for avoiding it. HINT: Provide the solution in your content in a brief overview form so you do actually give them useful information, and then lead the subscriber to an offer to thoroughly explain the solution which allows you to make a sale. There you have it – 10 ways to write headlines or subject lines that practically demand attention and create real results. Now here’s your action step – take the headlines you are using now and compare them with these. Can you modify what you are using now to fit these blueprints? If not, take the blueprints above and apply them to every product you promote online. Then begin testing these headlines in the ads you place, articles you write and more. These blueprints work – I hope you enjoyed them and profit from them as I have. Hi Charlie, I’ve had trouble getting to the comments on your Blog. Thank you for the great Headlines, I’m going to go back over my blog to have a look at mine. I’m happy you find them helpful. The comments on the blog “lazy load” which means they don’t all show instantly. This makes the blog run faster, which is a good thing. But it can be confusing, which is a bad thing. Thank you, some great chestnuts in there… must focus myself more to use better headlines! Feel free to use the templates as a starting point. I use them every day. Great information Charlie I always wonder about this method,people who you send emails to.I thought it was spamming now I know .One question is there a way you could send all of them with one click?. Thank you for your kind comments. I am updating the report with these headlines (and 90 more) that will be ready soon. I will email about it when it’s ready. That is a great question! I personally prefer 5 words or less. But I don’t always follow that rule, especially when 5 words does not convey the main benefit or create the right hook. I use the same structure for blog post titles that I do for headlines. Here are three articles you might enjoy about headlines. Charlie, You continue to present to us as an audience and members some very insightful material that always seems to have a very comfortable way of presentation. I respect and admire not only the quality but the amount of information you send our way and appreciate it very much. I have learned an extraordinary amount of useful material. Thanks for all that you do. Great article Charlie – lots of common sense gems in there! Keeping this somewhere safe for easy future reference. Thank you Gillian. Always great to hear from you! This is one of the greatest thing I stumble upon on Marketing. Incredible Important and Incredible Simple. Thanks Alfred! Always great to hear from you. GREAT STUFF! This is exactly what I was looking for as far as finding ideas for headlines that really attract those quality clicks. Thanks! Charlie, thank you for the fantastic Headline Template piece! You’ve got some headline “starters” I’ve never seen before – and they’re great. I will be printing this out and adding it to my swipe file. I recommend others do the same. Thank you very much, Charlie for this informative post. This is especially helpful, when I am faced with Writers Block. Thanks Monika! Great to hear from you. Love this post! Very helpful. I am guessing this method will work for writing text ads as well. Going to look at my texts ads and redo them to fit this formula. Thanks again for all your great information. So happy you liked it! Thank you for your kind words. This works for writing any sort of ads – solo ads, email subject lines, blog post titles. That’s what I love about it. Very valuable content Charlie, I ‘m saving this one! I would say, I’m beginner in this Marketin online, although trying for 6 months. What I previously worked, has no connection with this activity. I find it extremely interesting and educational article read here. We need to discover things they do not know and that I needed to build this business. Your guidance, give me hope that I will be able to start the engines. Thank you very much for your kindness to give me permission. This has been a hugely helpful post, Thanks so much, Charlie. well the incentives for making it big in the online world. network marketing books, one of the companies represented by him. This Website have a good background.. According to Chris Munch, “Test Post, Please Ignore” was his best title for open rate. Open or click through is not the be all and end all though. It’s a gimmick title that may get lots of attention but not necessarily the right attention. I agree. I would consider that a deceptive subject line. I know these things work, but at what price really? Trust, once lost, is so hard to regain. I could’nt agree more charlie, I have bit on those lines more than once and became upset for the waste of time they caused. Combine that with little success on line and it caused me to blacklist some marketers that may otherwise be good industrious people. I agree Charlie. When I’ve opened these deceptive type emails they get “unsubscribed to”. I’m too busy for that type of intrusion. Great list, a combination of what’s in it for your subscriber plus a little intrigue can go a long way….throw in a few power words that imply ease or speed and you have yourself a title. Years ago I was given a book from a great friend and written by Robert Collier .. “Greatest Article Writing Book”, not exactly the title but I know you will know the book. Charlie your wisdom of writing is amazing. I’ll be investing in you soon, I promise. Thanks Dori! I will be here when you are ready. Great post, lots of detail and very useable. Really appreciate it Charlie! Great work – as usual Charlie! I especially liked the fact that you included examples and some discussion about the “whys.” BTW – how is your brother (in-law I’m not sure) doing? Thanks Mark. He is doing wonderfully well. Thank you for asking. At his 6 month cancer checkup he was given a completely clean bill of health and a great prognosis. His hair is all back in, his weight is up and things are looking very positive. Thanks Charlie for the great info. I have been totally frustrated at times but you make things very easy to understand and I have a feeling that the person who gets this info can be very successful by following your valuable advice. I know I have. :] Thanks again. This is not a reply on the post, although, I have bookmarked it and written copious notes. My question is about the ad at the bottom of the post. If I reworded the third paragraph and credited Charlie in the last paragraph, could I use it as a solo ad? As you know, there are none available for FUSS and that looks like a great ad to me. Happy New Year!!! Be blessed and prosperous! Thanks for your advise, I have been trying to market for several years. Even had acouple blogs going, I haven’t given them up, just not done anything with them for a couple years…maybe it is time to pull them out of the cob webs and get them active again…I truly value your information! I would suggest focusing on one topic and making that work more than trying to maintain more than one successful blog at a time. Thank you for saying that. Provoking thought and providing real help, practical help, are my goals. I’m so happy you are here. Charlie, as usual great stuff. I will definitely be trying out some of this headlines..
Glad you like them! They work well for me and I hope they work well for you too. Just what I am looking for as I start a new ezine and blog. Thanks for your amazing generosity, Charlie. You know most marketers would charge for this. Great information. They’re attention grabbing, and forcing prospects to buy. It’s easy to forget just how much we are all influenced by a Headline. A good reminder Charlie and once again your information is so well put and easy to follow. Cheers. Happy you liked it. The headline really is an ad for the ad. Charlie, thanks a million for these inspirational proposals. As I never worked with e-mail lists I now want to start with them and your article gives huge ideas on how to set up a great campaign. I would like to thank you for the 10-headline-blueprints,they are superb. Charlie i’m sorry but i don’t know how but i let this one get by me . And i sure missed a great artical, thank you And charlie i am already a member. Charlie…..what a great, informative article for all us would-be internet marketers to utilise on our own websites. Thanks very much for all the help you have given in the past! First time writer but long time reader. Thanks Charlie, you continue to be a big help. Your guide to headline blueprint [key words] is great, this puts me more on track with confidence. Who needs any other when there is CHARLIE PAGE guiding the internet ship with honest no crap info..
Man more great stuff, off to re-headline all of my ads! Charlie your the MAN! Thank you Charlie for killer examples! I just think you are the easiest guy to understand……..your articles are so interesting. I have not read them all yet but I am happy I joined Doe. Well done on a great blog. I enjoy reading your posts. As ever, a diamond amongst the walnut shells! Thanks. Thanks, Charlie. These look really useful and able to be applied to a wide range of subjects. Thanks for your commitment to helping us! Thanks for the great blueprints. I’ll be trying some of these. Thanks for the blueprint Charlie wonderful. No-one opens my emails to read all my great stuff. lol ! I’ll try some of these and see if it helps. Thanks Charlie – this is fantastic. I’m going to start by using these blueprints step by step with my current offers. Thanks again!! Thanks Charlie for another valuable resource. I will review my autoresponder sequence and see where I can use these subject lines. THANK YOU CHARLIE. 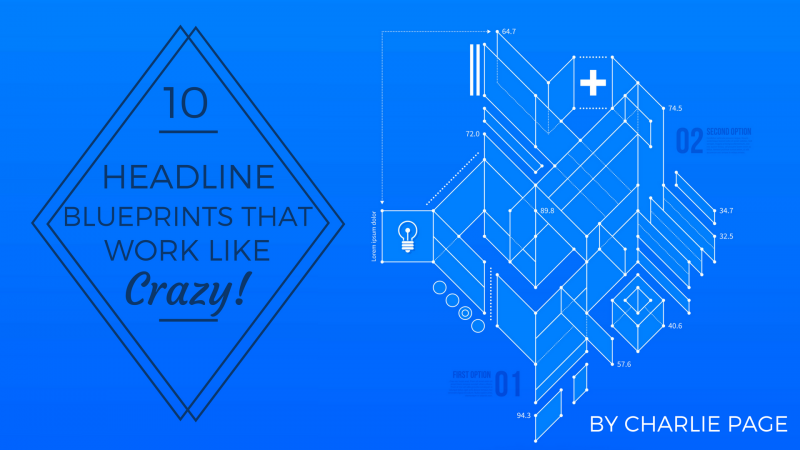 THE 10 HEADLINE BLUEPRINTS THAT WORK LIKE CRAZY ARE GREAT. I THINK IT’S BETTER , AND I’M ABLE TO WRITE SOME GOOD ADS NOW. VERY INSPIREING. THANK YOU. HOPE YOU ARE FEELING BETTER. . These are great headlines and easy to figure out . Thanks for the great article , I think I can increase my e-mail open rate by at least 50% now . With great content like this I don’t know why anyone wouldn’t subscribe to your blog . First a true thank you. You keep surprising me. That’s why I always open and read your emails. Even in Dutch I can use them. Do you mind me translating them I communicating this to my customers? It would be so much better if you would link to the article. But that would not solve the translation problem. I’ll work on installing a translator on my site. You keep amazing me. Great information and a big help. money, Stupid. Even if it is not perfect. Here’s the voice – publish what you write every day without concern for anything but one factor … will what you write help people. You can go back later and do all the keyword stuff you want to do. You can put your autoresponder up when you have time. But if you are writing and not publishing, which is what you describe (I’ve been there – I have 122 articles in draft right now) then you are standing alone in the woods where no one can hear you. So let’s let them hear you. Write the best stuff you can, publish something no less than 3 times a week and then see what happens in 90 days. It will be something good; I can almost promise you that. Publishing makes money. Getting ready to publish not so much. Amen to that answer – I also spend too much time thinking about what I’m going to write, and often lose focus on writing to help out someone else. Thanks for the headline blueprints – I’ll be having another look at my email headlines, and working to make them more effective with these! Thanks Nicki – happy you found it helpful! Those headlines were compelling – I wanted to click on most of them. A very useful list indeed, and a resource I’ll use many times in my writing. Well done. As has been said that the headline is the advertisment for the ad. These headlines will work because they address to to most commont fears: fear of loss and fear of not gaining what we could attain. Great resource Charlie. Simple, easy and I am sure very effective. I always turn to your information for clear, concise advice that works. Sharing with my list and Twitter folks. Great headlines, not so common in addition which’s a good thing. I’ll use this inside Followup Systems and the new DOE when it becomes available. The main problem is traffic, will be interesting to see what you’ve got in store there. Great! Thanks for sharing these! Thanks a million Charlie, What a wealth of info here to helps us be more successful…it seems simple is so hard to put together… we always try to make things so complicated…”keep it simple” works. Nice article! Will implement this tips. I’m having some problems with my open rates and clicks. Is Kajabi better than optimize press? I like Kajabi much more than Optimize Press, although I use both. Kajabi is a hosted service so it costs more but it does much more and they support you like crazy (live chat 24/7) and roll out new features. Kajabi really is the best product I’ve bought online in the last 5 years. That being said, Optimize Press is a fantastic product in its own right. Thanks for the blueprint a great addition to my swipe file. I must confess that I sometimes struggle with coming up with good headlines. I am sure this will help a lot. Hi Charlie, and I hope you don’t take offence that I’m not leaving this comment to you directly, but to anyone who comes to this page to leave a comment. I want to go on record here and share something with everyone. I have been around IM for two years, mostly copy and ghostwriting for (in their own mind) ‘guru’s’. These people paid me to rewrite and repackage old stuff of theirs (and others) to resell as a new package to unsuspecting ‘newbies’, that, and the lack of care they felt for their customers left me feeling a more than a little ‘unclean’. I decided to use my words to build my own IM business not someone elses, and I contacted Charlie last week to ask his advice about joining the Directory of Ezines. I had my check book out and would have signed up immediately because I like Charlies style of doing business. But he told me DOE wasn’t what I needed just at the moment. Can you imagine that sort of honesty? I have been working for sharks who would have taken my money and then called everything ‘my fault for not taking action etc”, but Charlie turned me down as DOE wasn’t the best fit for what I wanted to achieve. He did suggest taking a look at Follow Up Selling Systems (a suggestion, not an atempt to sell it, and I was in the process of doing so when his email popped into my inbox pointing me to this article. Which brings me full circle back to the article! Charlie, if this is the quality of information and support that is on the charter membership side of FUSS, its a no brainer, and I’m in. This is class advice. Thanks for sharing this and I look forward to learning a lot from you in the months to come. Thank you kindly for sharing these subject lines. They couldn’t have come at a better time, as I’ve been trying to create a few myself for the launch of a new email campaign. I’ve already decided on using at least two of yours now and will split test to see what returns I get. In addition. I’ve been testing myself to see what makes me open some emails I receive. There’s no doubt that a good attention grabbing headline does the trick. Great work Charlie and thanks again! Great article filled with valubale tips. All the headlines are wonderfully crafted and easy to understand. Thanks so much. This is an excellent resource! Very helpful article about headlines, full of great info. Thank you for sharing Charlie. I agree with the others…this is one of the best, most helpful articles I’ve read in a long time. Any of us who write for our sites, blogs or freelance can always use solid advice that works! Once again, you have given more useful information that everyone can use. Thank you Charlie. Honestly this is one of the best reward I got from you since I;m a member of DOE.. The reason why this is so important to me is because I’m “BAD” creating headlines. This could be one finest aricle I might have read in a long, long time! Compact, concise, highly effective and works everytime when it is used..
As for more subject lines, here is something that’s wrtten many years back and I still use them effectively. BTW, may I use your great article (of course with your byline) on my website? Thank you for your kind words. I’m sorry you can’t publish the article on your site but you certainly can link to it! I learned more from this article than anything else I have read on the net. Thank you so very much Charlie. You are brilliant. Thank you for sharing these headlines with us. They are really great attention getters. for fr.ee is much better than most want to charge for. Thanks for sharing those great head lines, being honest and down to earth. Those articles will help me a whole lot. I am proud to be on your list. Thanks Charlie, Just what I needed for my autoresponder. I know they’ll get opened because they’ll want to see just what I’ve got for them. Great headlines! I look forward to using the blueprint. As always Charlie its right on the money! Bless you for this. Thank you for your article about He linens, I cadent believe how you wrote in details So can every one apply even me to. My first email going be tomorrow to send to ViralURL with new headline. Thank you for these, and i’ll combine with keyword of the ads i promote. Awesome Charlie and timely too! I just want to thank you for the list of headlines. It was just what I needed. Nice one Charlie! Nice long article, packed full of useful content…Thaks very much! Great article Charlie! I have learned a lot. I will follow your suggestions, the nest time I post an email. knowing they would never market it and lose billions off their products (lessening the sickly numbers). And next page Just Been Paid (60% compound interest MONTHLY…real and sustainable). Love the headline starters! And for someone who is on the same year my wife and I are on in marriage, I think there must be a kinship there somewhere, yes? Brief backgrounder. ;..that you never asked for, but hoping it all comes together for you in some convoluted fashion. I was the guy who started the Consultng Opportunities Journal and Consultants National Resource Center in Washington, DC in the late 70s and 80s. I’m also the guy who with ‘the recovering attorney’ the late great Hal Wright, co-founded the National Association of Business Coaches (which I sold in 2002– and still suffer seller’s remorse from my actions!). Now, as an official Boomer, I’m trying to help protect oldsters from fraudsters in the funny link in your Website box above. We will be looking to involve the business communities in every county we have a presence in. We also want to earn some money, have each of our ‘chapter presidents’ earn some money with those business communities in order to build a fund(s) for defrauded seniors in each county. Sorry about the long copy…(fed and clothed our family of 5 with my copywriting in the 70s and early 80s, but it’s been too painfully long since I had the discipline of a client). Hence, I just ramble now…just pitiful. After looking at your stuff, you seemed the right person to pour my heart out to in regards to AAEA, Michael. Thanks for the couch time! Post Script: Charlie, I have no idea why I called you Michael in my post–except that I just spoke to our second born son, Michael, who is running a big store for Nike in California. And I’m in Maryland (just outside DC) so we’re three time zones away. What a chunkhead I am! My apologies. No worries. I figured that something like that happened. Interesting background. I don’t see a way we can work together individually at this time. Thanks for asking. I would strongly suggest building a list from day 1 and using a service like Kajabi if you are going to create a membership area of any kind. I have discovered that the freedom that comes from paying for services that save time and headaches is well worth the cost. I just wanted to thank you for the headline blueprints and i will make sure to keep in touch. Thanks for this. A fantastic list that will really speed up my ezine and auto responder writing. Thanks a lot! Charlie. This is so good with all the explanations. I really appreciate the education. Thank you so much for sharing these great headlines. and article submission.? I hope you kindly help me for this. nothing but improve the Quality even more. I once keep it a secret as If I knew anything about D.O.E. because it was my own private secret weapon. It is a honor to know Charlie and work with him. Killer article Charlie! All the headlines are simple, easy to understand, and short for fast reading. All important to communicate with prospects and customers. These headlines say “easy,” “profit,” “save money or time,” and make the reader curious to read the ad. And that’s what makes Americans pay attention and buy!